A sub-cluster is a YARN cluster with up to a few thousand nodes. The exact size of the sub-cluster will be determined considering ease of deployment/maintenance, alignment with network or availability zones and general best practices. Global Policy Generator overlooks the entire federation and ensures that the system is configured and tuned properly all the time. A key design point is that the cluster availability does not depend on an always-on GPG. The GPG operates continuously but out-of-band from all cluster operations, and provide us with a unique vantage point, that allows to enforce global invariants, affect load balancing, trigger draining of sub-clusters that will undergo maintenance, etc. More precisely the GPG will update user capacity allocation-to-subcluster mappings, and more rarely change the policies that run in Routers, AMRMProxy (and possible RMs). 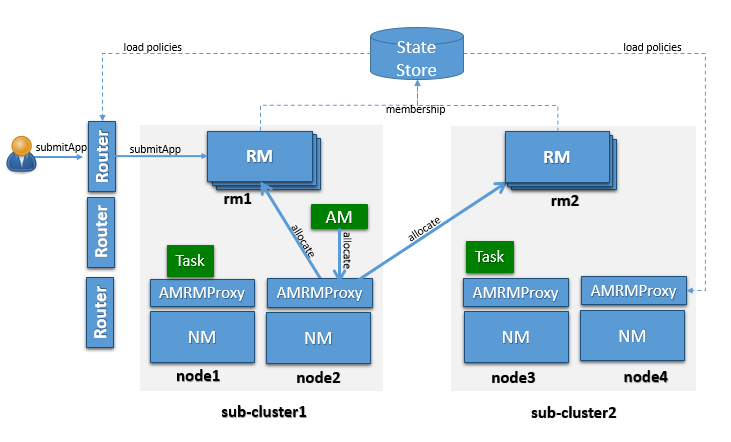 The federation Policy Store is a logically separate store (while it might be backed by the same physical component), which contains information about how applications and resource requests are routed to different sub-clusters. 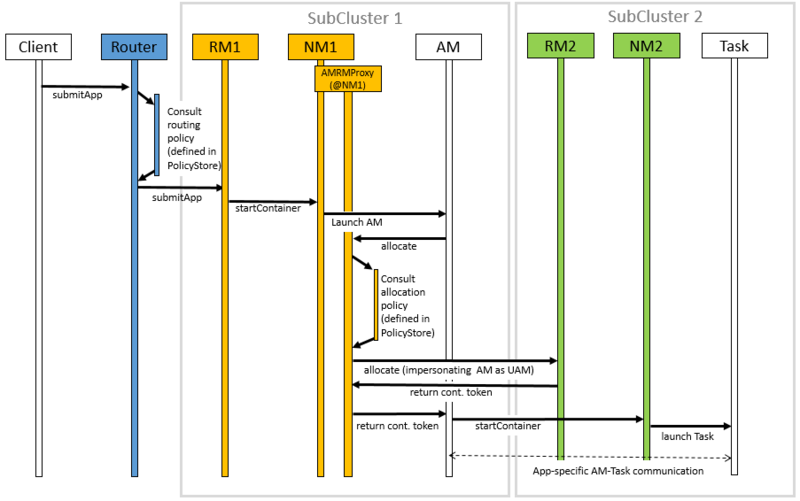 The current implementation provides several policies, ranging from random/hashing/round-robin/priority to more sophisticated ones which account for sub-cluster load, and request locality needs. yarn.resourcemanager.epoch <unique-epoch> The seed value for the epoch. This is used to guarantee uniqueness of container-IDs generate by different RMs. It must therefore be unique among sub-clusters and well-spaced to allow for failures which increment epoch. Increments of 1000 allow for a large number of sub-clusters and practically ensure near-zero chance of collisions (a clash will only happen if a container is still alive for 1000 restarts of one RM, while the next RM never restarted, and an app requests more containers). yarn.router.clientrm.interceptor-class.pipeline org.apache.hadoop.yarn.server.router.clientrm.FederationClientInterceptor A comma-separated list of interceptor classes to be run at the router when interfacing with the client. The last step of this pipeline must be the Federation Client Interceptor. 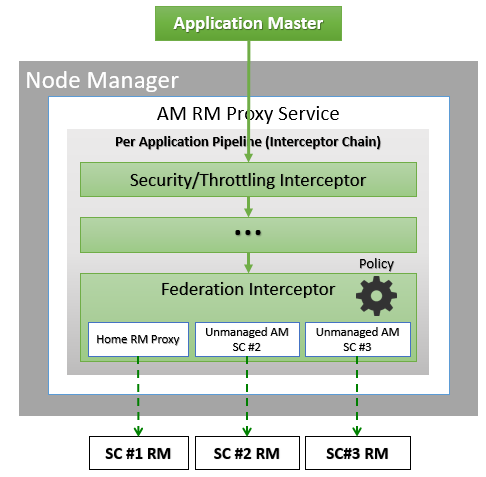 yarn.nodemanager.amrmproxy.ha.enable true Whether or not the AMRMProxy HA is enabled for multiple application attempt support. yarn.resourcemanager.scheduler.address localhost:8049 Redirects jobs to the federation AMRMProxy port.